For years, Kirsten and I had dreamed of doing something different with our lives. We didn’t know exactly what that something was, other than we wanted to live somewhere new, get more adventure in our life, and be more entrepreneurial / less dependent on the “corporate world”. Beyond the aspirations, we didn’t have the first clue in how to create that life. And then about 18 months ago, Tim Ferriss entered my life. 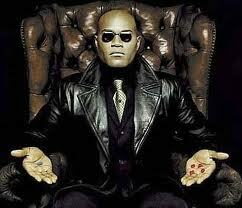 Or as I like to think of him, my own personal Morpheus. Morpheus : This is your last chance. After this, there is no turning back. You take the blue pill, the story ends. You wake up and believe…whatever you want to believe. You take the red pill, you stay in wonderland…and I show you just how deep the rabbit hole goes. That’s the disclaimer that should come with Tim’s book, The 4-Hour Workweek. If you’re fully satisfied with your current working life, taking a vacation a year, and waiting until you’re 70 years old to “really live your life”, then don’t read this book. Seriously. Take the blue pill and click away now. Ultimately, this book was the catalyst for our Hawaii move. For me, the power of the book was in gaining a completely new way to think about my life. Many of the concepts will appear obvious in retrospect, but Tim gives you a terminology, structure, and process to help you understand and deliver it all. In the book, Tim talks about bursts of 3-6 months doing some grand adventure in a cheap-to-live country while you collect your hassle-free US dollars from your remote business. Not exactly our path, in that we are going to a high-cost island while continuing to do some “traditional” work. The key part of this for us was “temporary adventure”. For years we were stuck about where we’d want to move, and this got us unstuck and inspired doing Hawaii. It’s a year (or more) of following our passion. Most of us live life backwards. We get whatever best job we can, then hope to get a WHOLE WEEK OFF to do what we love once or twice a year. Tim starts you off with articulating your own dream adventures. From there, he helps you work backwards to figure out how to get income to support the adventure side. This concept spoiled my interest in having a full-time regular job anytime soon. Probably ever. In our case, we figured out that we wanted to live in Hawaii for a year, then started to figure out all the elements necessary to support it. In our case, our income plan has Chuck working remotely part-time for his current company and some upside in some new business ventures. I love this phrase, coined by Tim. In fact, I tried to get the phrase as the URL for this blog. Everything in your life is temporary. Everything can be changed. Once you go through the dreaming stage to explore what you really want out of life, you’ll look at all the “supporting” elements differently and work to bend them to your will. One downside is that the business formulas for getting to your “4-hour workweek” are a little flimsy. The concepts are great, but going from zero to fat income isn’t nearly as easy as suggested. It doesn’t matter – consider this more of a lifestyle guide than a “how-to” on getting rich with little work. I came to that realization after about a year of struggling that I couldn’t find my automated business to let us travel the earth freely, we stopped trying to be so literal with following the book and instead followed just enough of his recipe to accomplish our “Year in Hawaii” dream. Articulate your dreams and Tim will help you find the way. Morpheus: I’m trying to free your mind, Neo. But I can only show you the door. You’re the one that has to walk through it. What do you say? Will you walk through the door? Previous post: Have you found a place to live yet?